You could win a Plantronics Discovery 975 BT Headset. Details @ end of this post! More and more, we hear about talking on cellphones (and smartphones) while driving becoming a big no no. I have to say that I agree with that decision. I've had more than enough near misses that I would have liked to experience. Mostly because someone is on their phone, rather than having two hands on the wheel. There are obviously two decisions to consider; don't use your cellphone/smartphone or use a headset. There are more Bluetooth headsets around than you can shake a smartphone at. Some look sleek and elegant, but have poor audio quality, while others look clunky, but sound great. A few lucky headsets benefit from the best of both worlds. I've had my fair share of Bluetooth headsets over the years. Perhaps I'm being picky, but a small part of me always wonders if there is a better sounding device out there. I want crisp clean sound! I want an ear drum delicacy! I want power and pizzazz without being pretentious! Ingeniously Simple. That's what Plantronics is calling their new Discovery 975 Bluetooth Headset. Within its elegantly minimal design, sound is mastered using Audio IQ and WindSmart Technologies. Like the sound of it so far? As their slogan points out, Plantronics is all about sound innovation. Looking at their history, one memorable claim to fame will always stick with me; "That's one small step for (a) man, one giant leap for mankind..." was transmitted through a Plantronics headset. 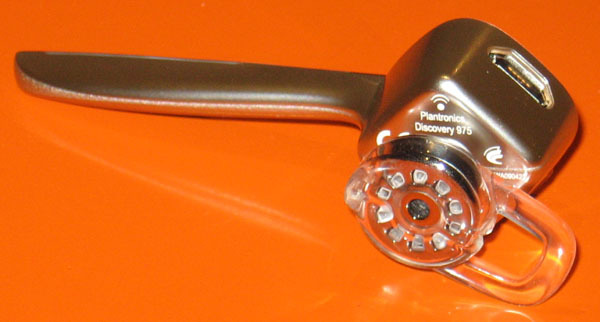 The Discovery 975 borrowed its diamond shaped body design from its older brother, the previously reviewed Plantronics Discovery 925. Rather than using its predecessor's v shaped boom mic, the 975 take a much slimmer approach with a thin boom mic. I find that when driving, I don't want to fumble over numerous buttons while trying to answer and adjust buttons. Plantronics must have heard me griping, because they have simplified these controls. The multifunction button is built into the boom - it's specifically located under the LED indicator. Another button controls the volume. That's right, I said button, not buttons. Each volume button tap increases the volume by a pre determined increment. After reaching the max volume, you can drop the volume to minimum by pressing the volume button once more. The mic isn't easily seen in the boom. At the end of the boom, you can make out vents and screens for the mic. Last, but not least, the diamond-shaped body is accented by faux black leather on the front. So far, the looks make it seem like a perfect partner to my Bold! 1. The side of the screen sports a status screen. This screen will indicate the battery life of both the headset and case. A Bluetooth icon also tells you if your headset is connected to a device. 2. Taking the 925 out of the case offered a bit of a hassle. This case comes with a quick release lever; launching your headset out of the case and into your ear! Well...not really, but you'd have to admit it would be cool. The lever gently removes the headset from the charger. 3. With the original case, the only carrying option was to pocket it. 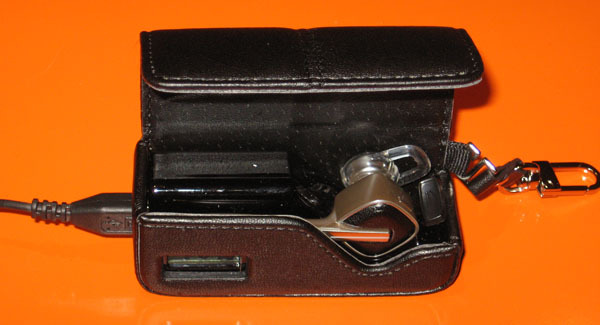 The included case strap lets you clip it to your bag, belt clip, or even use it as an uber bulky key chain. Wearing the headset was fairly comfortable, as the gel tip sports a stabilizer loop. This allows for a more secure fit, without causing any irritation. I was able to vigorously shake my head without the headset falling off. This worked in my favour, as I used the headset to call my wife so she could pick up some Advil for my new migraine. 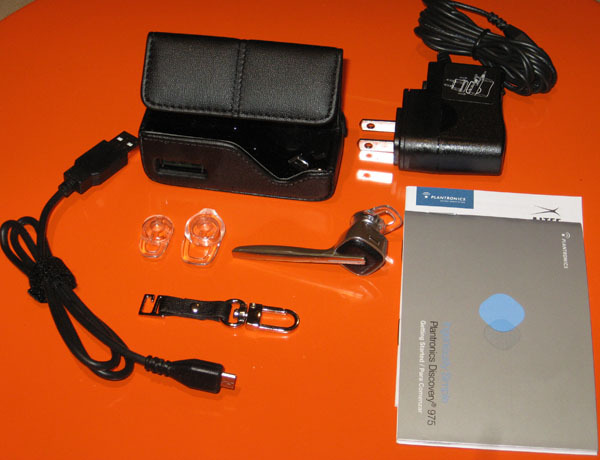 The two big buzz words surrounding the Plantronics Discovery 975 Bluetooth headset; Audio IQ and WindSmart Technologies. The dual mic Audio IQ solution strives to focus on your voice, while canceling out your noisy background. Your incoming audio is adjusted to optimal levels, based on the noise level of your surroundings. According to Plantronics, the 975 has a 20-band equalizer that produces a true natural sound, rather than giving you a metallic voice. The downfall to this is that it does take a second or so for Audio IQ to start working, resulting in a slight distortion in the audio at the beginning of the call. WindSmart takes a different approach to noisy nuisances. The previously mentioned vents and acoustic fabric are located near the end of the boom. These are specially designed to deflect and block the wind. An electronic filter is in place to eliminate wind noise. This would work when on foot but, when driving with the window open, the wind almost overpowers your voice (I was barely heard at 65 km/h with the window open). When compared to previously reviewed headsets, it did still out perform in audio quality. It worked well in environments with little noise, but had difficulty in areas with moderate noise or higher. Suggested MSRP - $129.95. Available for for $119.95 at ShopCrackBerry (@ time of post).